Abstract: Tuberculosis is a serious respiratory infectious disease. The occurrence and prevalence of drug-resistant tuberculosis is one of the main reasons for the recovery of tuberculosis epidemic situation since the middle and late 1980s. According to the World Health Organization (WHO), the global situation of MDR-TB is serious. The two countries with the largest number of MDR-TB patients in the world are China and India. The high drug resistance of tuberculosis is easy to lead to tuberculosis difficult to cure and accelerate the death of tuberculosis patients has become a major obstacle to the current clinical work and prevention and treatment of tuberculosis. A cross-sectional study was conducted to collect tuberculosis patients hospitalized from December 2013 to December 2017. Eighteen patients with drug-resistant tuberculosis and 49 patients with non-drug-resistant tuberculosis were selected as subjects. Logistic regression model was used to analyze the risk factors and to explore the risk factors of drug resistance in patients with tuberculosis. Retreatment and cavity in chest CT are the main risk factors for drug resistance in patients with pulmonary tuberculosis. It is of great significance to take effective intervention measures as soon as possible from the source to reduce the occurrence of drug-resistant tuberculosis. Retreatment and cavity in chest CT are the main risk factors of drug resistance in patients with pulmonary tuberculosis. Abstract: To investigate the effect of Telmisartan intravitreal injection on diabetic retinopathy and its protective mechanism. 54 adult male C57B/6L mice were included in this study. All the mice were randomly divided into blank control group (8), solvent control group (8) and diabetic group (36). Diabetic mice was intraperitoneally injected Streptozotocin (STZ), and sodium citrate buffer was intraperitoneally injected in to the solvent control group. According to the drugs given in the vitreous cavity of the left eye after modeling, diabetic mice were randomly divided into Telmisartan group, Conbercept group and model control group. Western blot was applied to detect the protein expression of VEGF-A, RAGE and TNF-α. HE staining was used to observe the changes of retinal morphology in each group under an optical microscope. The expression levels of VEGF-A, RAGE and TNF-α were significantly increased in the model control group compared with the blank control group (P<0.01). The expression levels of VEGF-A, RAGE and TNF-α in the left eye of Telmisartan group were significantly lower than that in the right eye ((P<0.01). The expression levels of VEGF-A, RAGE and TNF-α in the left eye of Conbercept group was lower than that in the right eye (P<0.001 for all). There was no statistically significant difference in VEGF-A, RAGE and TNF-α (P<0.01) between the solvent control group and the blank control group. There was no statistically significant difference in VEGF-A, RAGE and TNF-α (P<0.01) between the left eye and the right eye of the model control group. HE staining results showed that the retinal cells of the normal group had clear boundaries, normal morphology and neat arrangement of nerve cells. In the model control group, the retinal boundary was not clear, the cells were vacuolated and the nerve cells were not arranged in order. Intravitreal injection of Telmisartan can improve early diabetic retinopathy in mice by inhibiting the expression of VEGF-A, RAGE and TNF-α. 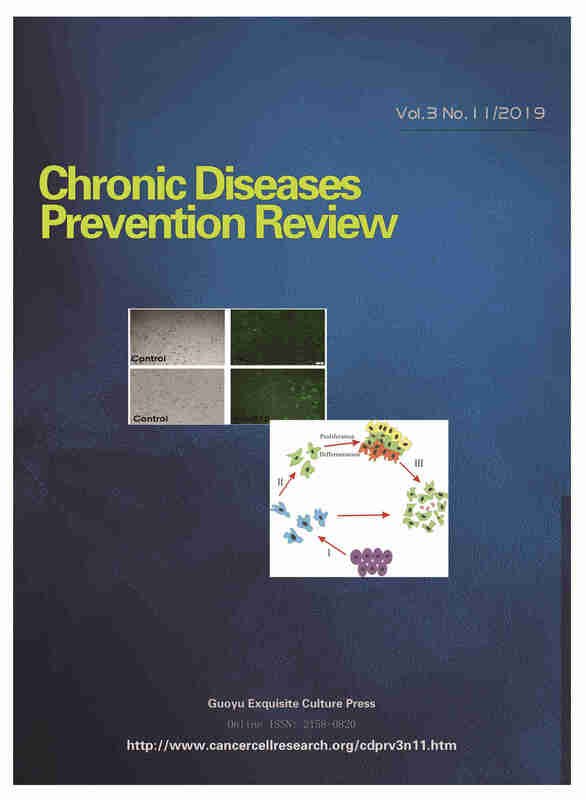 Abstract: To investigate the changes of serum trace elements in patients with type 2 diabetes mellitus (T2DM), and to provide evidence for the prevention, control and treatment of type 2 diabetes mellitus. A cross-sectional study was conducted in 50 patients with diabetes mellitus and 50 healthy controls. The contents of trace elements in serum were determined by inductively coupled plasma mass spectrometry (ICP-MS). T test was used to analyze the difference of serum trace element levels between type 2 diabetic patients and healthy controls. Compared with the healthy control group, the body weight and BMI of the diabetic group were increased significantly (P<0.05), serum B and V levels were significantly lower in diabetic patients (P<0.05), and serum Co and Mo contents were not statistically significant (P>0.05). Abstract: As the population ages and accelerates, the process of aging is intertwined with the contradiction between family miniaturization, empty nesting and economic and social transition. The growing number of special groups such as disabled elderly and demented elderly has received increasing attention. The elderly population (the elderly population in this article refers to the elderly aged 60 and over) is in increasing demand for health services. How to properly solve the "old doctors" has become a realistic problem that needs to be solved in the construction of the public health security system. This paper analyzes the current situation of China's healthy old-age care, combined with the existing supply of old-age health services in China, proposes suggestions for improving and promoting China's healthy aged care service industry, in order to promote the sustainable development of health care services. Abstract: The aim of the study was to assess the relationships between dietary intakes of antioxidant vitamins C, E and Vitamin A active substances (carotenes) with mortality in large cohort studies. Relevant English-language studies were identified though Medline, EMBASE, and web of science database till February 2018. Multivariate-adjusted risk ratios (RRs) for mortality in the highest verses the bottom category of baseline intake of antioxidant vitamins C, E and Vitamin A active substances (carotenes) were pooled using a fixed-effects meta-analysis and reported as relative risk (RR) with 95% confidence intervals (CIs). Meta-regression was used to assess the effect of covariates across the trials. Over the follow-up ranging from 3 to 32 years, 51,277 mortality events occurred among 419,837 adults from 14 cohort studies. Pooled relative risks comparing extreme carotene categories (high versus low) were 0.85 (95%CI, 0.80-0.91; P<0.001; I2=45.2%; Pheterogeneity=0.044) for total mortality, 0.83 (95% CI, 0.78-0.91; P<0.001; I2=23.5%; Pheterogeneity=0.258) in Eerope. Pooled relative risks comparing extreme vitamin C categories (high versus low) were 0.88 (95% CI, 0.81-0.95; P<0.001), with significant heterogeneity detected among studies (I2=87.5%; Pheterogeneity=0.0001).Vitamin E intake have no beneficial health effects 0.94 (95% CI, 0.80-1.00; P<0.001; I2=45.4%; Pheterogeneity=0.050). The present finding suggests that increased intake of vitamin C and carotene in diet may benefit prevention of death, but we do not find the evidence for higher intake of vitamin E was associated with the risk of death.